While waiting for beloved at SM North EDSA a couple of days ago, I happen to pass by this small store at the Sky Garden which piqued my curiosity. When beloved arrived, we went back here because I was pretty hungry as I haven’t eaten yet that day. Great British Take-Out boasts that all their items are below 100 Php. Since it has “take out” in its name, has Austin Powers references in their poster, and we were catching up with our friends to go to a movie, I thought this was a perfect place to try out. Their menu really did consist of stuff under 100, but it was a bit brow-cringing that their top items were 95 Php. The price was still pretty fair, despite that. Their specialty were finger foods with chips (fries). I ordered their Shaggy Fish and Chips, priced at 95 Php. You get to choose what kind of chips and dip to go with it. I got their randomly chose their hand-cut fries and honey mustard sauce. It came in a plain styro package perfect for take out. I thought the servings were pretty generous for its price. 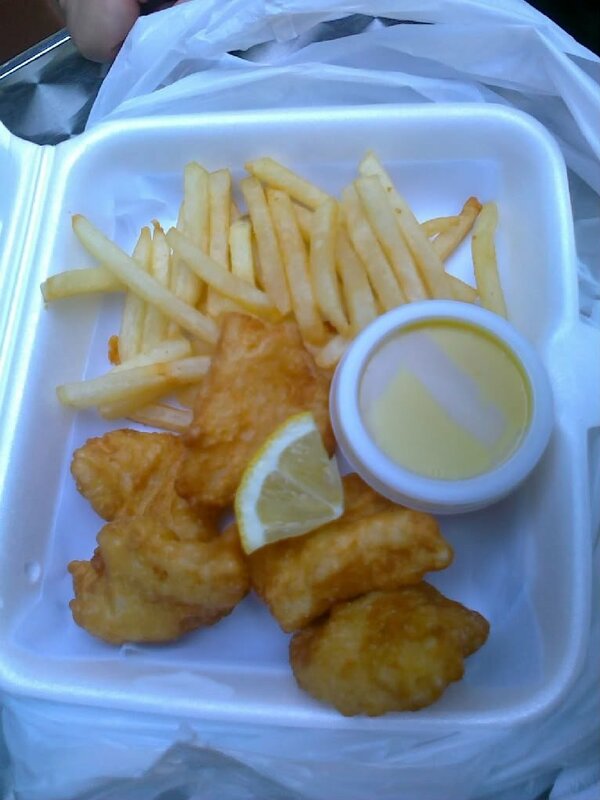 Half the container was filled with bite sized fried fish and the other half with fries. The fish had its expected flaky fried fish texture, and was piping hot. The hotness goes for the fries as well. That said, the taste was pretty bland, but the tarty-sweet honey-mustard dip was enough to please my palate. The downside of the meal was some pieces of the fish had too much flour taste in it. Luckily, it only affected a couple of pieces. It took me a day to think of what to write about this store, because it’s not really exceptional but it’s also not bad. It succeeded in its goal to provide Great Britain specialties (I guess fish and chips tops my list and I can’t really think of any other) at sub-100 Php prices. But then again, there are plenty cheaper snack stores you can go at cheaper prices and more filling quantities with a drink to go with it. Their fish wasn’t really the best, and their fries weren’t as plentiful as I would’ve wanted it. Still, if you’re slightly on a budget, want something different from the usual siomai or stick foods, happen to be passing by at the Sky Garden, and need food on the go, I guess this place is worth its price; after all, hunger is the best spice—honey-mustard ties for the countless number of sauces for second. Location: SM North EDSA Sky Garden. Recommended for: Starving passersby on the go. Not recommended for: Passersby with exquisite tastes. Smart nomnomnom tip: They cook it as you order, so expect it to be hot.